I apologize for not having a review of last week’s episode “Quite a Common Fairy,” but sometimes things get lost in the shuffle. I enjoyed last that episode and the introduction of Tinker Bell (Rose McIver). I particularly liked the idea that Regina (Lana Parrilla) actively prevented her own happiness because she was afraid of sacrificing her identity. I think that’s actually a very relatable feeling. Though most of us are not evil queens who practice black magic, many of us can relate to the idea of not moving past negative aspects to our lives because it’s all we have. Moving on to this week’s episode, “Nasty Habits,” the title most directly refers to Rumplestiltskin (Robert Carlyle), who must overcome his desire for power to save Henry. I think they are doing a great job in further developing his backstory. His has always been the most developed in the first place and I wouldn’t have thought there was a lot more they could do, but I was wrong. This episode deepened his troubled relationship with his son, both in the flashbacks and the present. 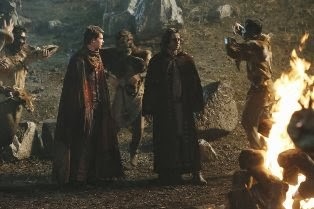 Both Rumplestiltskin and Neal (Michael Raymond James) seem desperate to find each other, but as soon as they do they are at odds. I like that they can’t seem to connect completely, because it fits the story and characters best to have that tension. One of my favorite things about this episode is that Rumple referred to finding Neal as his ‘happy ending.’ It seemed that the story had been pointing to him finding true love with Belle (Emilie de Ravin), but I have always found the father-son bond to be a much stronger story. So far Belle has only appeared as a vision Rumplestiltskin has when he is feeling conflicted. She is really only a part of his subconscious and therefore only reflecting his own thoughts about himself. This makes their conversations a little awkward and uncomfortable since he can’t come to terms with what kind of person he wants to be. This episode also furthered the story of Peter Pan (Robbie Kay), which is turning into one of the best plotlines since the first season. 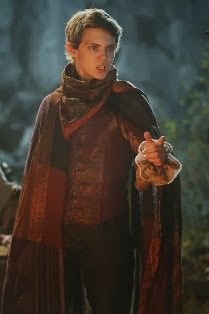 They cleverly established that Peter is able to lure his “lost boys” because he is also the Pied Piper. It turns out that he and Rumplestiltskin were close friends at one time. Only boys who feel unloved and unwanted are able to hear Peter Pan’s/Pied Piper’s pan flute playing, which ties into Henry’s (Jared S. Gilmore) current situation. Henry has steadfastly been resisting Peter’s influence, but as time wears on with no rescue, he is becoming more interested in the freedom living with the lost boys provides. The sad thing is Neal did come to rescue Henry, but of course Henry was completely unaware. Things got all screwed up because of Neal and Rumplestiltskin’s unwillingness to work together – well more Neal’s unwillingness, but Rumple maybe hasn’t done enough to show his true motivations. What I like is that these relationships all tie together and they have consequences. It’s a good follow-through on the story, which is something that was missing a lot of the time last season. 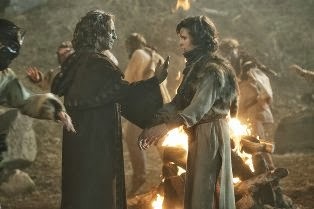 This episode was Rumplestiltskin/Neal-heavy, so much less time was spent on the other characters. One ongoing thing I have yet to mention is that Charming (Josh Dallas) was struck with a poison arrow and supposedly only has days to live. He’s not sick or anything like that, I guess he will just drop dead when the time comes. He hasn’t told anyone except Hook (Colin O’Donoghue), which is a pretty selfish move, especially since Regina might be able to do something. At any rate, the reason I haven’t talked about it is that I don’t think for one second they are really going to have him die, so there not really that much suspense. So unless they prove me wrong, I’m considering it not that important of a plotline. So far season three is keeping my attention and has me looking forward to what’s going to happen next. I hope they keep up the good work.